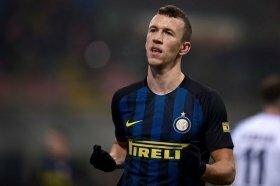 Inter Milan are reportedly prepared to sanction the sale of long-term Manchester United target Ivan Perisic when the season comes to a close. The Croatia international has been heavily linked with the Red Devils over the past two summer transfer windows but on both occasions, the Nerazzurri are deemed to have rebuffed the chance to sell him. However, this appears to have only unsettled the winger, who has publicly confirmed the prior interest from United while admitting he still savours the prospect of playing in the Premier League. According to Tuttosport, the Nerazzurri could sanction the Croatian's sale at the end of the ongoing season, should any club match their asking price of £45m. United could revive their interest in the attacker, should Jose Mourinho remain at the helm but they are likely to face added competition with Bayern Munich and Atletico Madrid among the other admirers. Perisic has struggled to showcase his best form in the Nerazzurri shirt this term but he has still contributed towards four goals for the San Siro outfit in all competitions.